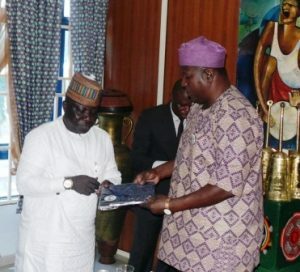 The Director-General National Council for Arts and Culture, Otunba Olusegun Runsewe has officially approved Press Gallery as a credible media organization to showcase its flagship programs, African Arts and Craft Expo (AFAC) and National Festival of Arts and Culture (NAFEST) both scheduled to take place in August and October this year respectively. He made this known when the media team led by its Publisher/Editor in Chief, Isiaka Mustapha paid a courtesy call to the culture headquarters in Nigeria stressing that invitation to cover NCAC events will only be extended to those who are worthy and have proven their mettle and professionalism in media practice beyond reasonable doubt. Buttressing his points, Runsewe said with the prompt reportage of Press Gallery, he is sure that Africa Arts And Crafts Expo, 2017 will be well covered. In his words, “having distinguished yourself with outstanding reportage, I have the strong belief that with you on ground during the forthcoming AFAC and NAFEST, the entire world will be adequately informed through your reliable and dependable coverage network’’. 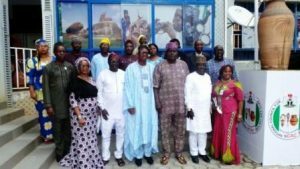 The culture icon Otunba Runsewe, poured his appreciation on the editorial team of the media outfit led by Isiaka Mustapha for giving the council massive coverage despite the short time of his coming on board”you have been giving prompt coverage of all our events. Speaking further, leader of the team, Isiaka Mustapha expressed his profound gratitude to the DG for being a committed father and supporter of Press Gallery media organization. Delivering a very passionate speech, Mr. Isiaka said, “As a body we couldn’t have stood without your support, generosity and magnanimity while we were building our permanent corporate headquarters which you personally declared open in 2013. You remain one Nigerian who is detribalized and a man of honour and integrity in all dimensions. The Press Gallery Editor congratulated the culture helmsman on his well deserved appointment saying, “We are here to felicitate with you on your new appointment as Director General of the National council for Arts and Culture. Like the transformation you recorded at the Tourism Industry, it is our firm belief that your tenure at the culture sector will also witness enviable heights.